Posted on Sat, Jul 10, 2010 : 5:30 a.m.
Mr. B leads his Joybox Express tour. At left rear is Brian Delaney and at right rear is Pete Siers. Local blues and boogie woogie pianist Mark Lincoln Braun, better known as Mr. B, hasn’t just been tickling the ivories lately; he’s been hauling the ivories, by bicycle, across the state for the second Joybox Express tour in two years. Covering about 300 miles in two weeks, Mr. B and his band — Pete Siers (drums), Brian Delaney (guitar), and Carl Hildebrandt (bass) — kicked off the tour in Saugatuck on July 2, and they’ll be stopping in Ann Arbor for a Top of the Park show on Sunday, July 11 at 6:30 p.m. —Â the last night of ToP this year. Earlier in the day, he'll be at the Chelsea District Library at 1 p.m. (This year’s Joybox tour will conclude in Detroit.) The tour aims to not only share live music experiences in a unique way, but also to raise money for arts and athletics organizations for young people. This year’s tour mileage is about twice the amount Mr. B covered last year, when he traveled with his former student Lance Wagner from Flint to Ann Arbor. But before all this could happen, Braun needed a custom-made bike, built for the specific purpose of taking his show — which is to say his piano — on the road. Custom-made bikes are expensive, of course, so Braun applied the proceeds from a CD (“9 Pianists, Our Town, Our Time”) that featured music by accomplished local pianists, and had been recorded during a benefit concert at Kerrytown Concert House. 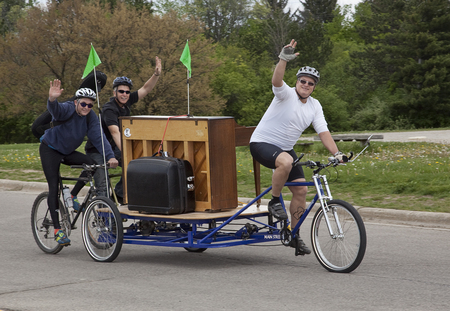 The bike, built by former Ann Arborite Mark Nobilette, allows for two additional riders to hook onto the back, after removing their front tires, as “pusher” bikes, and keeps the piano stable behind Mr. B. Under normal conditions, hauling a piano by bike would be a challenge; but a rash of uncomfortably hot, sticky days has added an extra obstacle this year. The other band members, meanwhile, are hauling their own instruments; and Hildebrandt — a Pittsburgh-based pediatrician — closed his practice for two weeks in order to be part of the tour. and it’d be hard for me to overstate this, really, but I know a lot of really, really fine musicians all over the world, few of which would be interested or would be capable of doing what we’re doing physically,” said Braun. “And then I know a bunch of really physical people, very, very few of which would be able to do what we’re doing musically. “People have been so positively moved by what they see and what they hear,” said Braun. Who: Blues and boogie woogie pianist Mark Lincoln Braun, known as Mr. B, and his band: Carl Hildebrandt (bass), Brian Delaney (guitar), and Pete Siers (drums). What: Part of the Joybox Express tour, wherein Mr. B and his band haul their instruments, by bike, from Saugatuck to Detroit to play music and raise money for arts and athletics organizations for kids (including Ann Arbor’s Wild Swan Theater). Where: Top of the Park, 915 E. Washington St. When: Sunday, July 11 at 6:30 p.m. An earlier stop will take place at the Chelsea District Library, 221 S. Main in Chelsea, at 1 p.m.
How much: Free, with a suggested donation of $3 per person, $5 per family. Braun and his band play scheduled shows throughout the tour, urging listeners to donate directly to charities like Wild Swan Theater and Chelsea Center for the Arts. But inevitably, spontaneous, unexpected performances are part of the Joybox Express tour, too. On the Fourth of July, for instance, Braun and his band found themselves on a dirt road. “We were in farmland — large farms, dirt roads, neighbors far, far away from each other, practically zero traffic, hot hot hot,” said Braun. A young couple in their 20s, in a car with two kids, directed the band to a paved road. “They were about to drive off, and I said, ‘Wait a minute, we’ve got a present for you,’” said Braun. “We lifted up our tarp and showed them the piano, and they’re eyes just got huge. So I played some boogie woogie. And you have to wonder what that means to people. Fri, Jul 9, 2010 : 11:52 a.m.
Go get em Mr. B. My sister, Mary Helen is smiling down on you! Fri, Jul 9, 2010 : 10:39 a.m.
Bike helmet's off to the man - go Mr. B.
Fri, Jul 9, 2010 : 8:47 a.m.
Mr. B never fails to amaze and mesmerize his audiences and friends. A class act thru and thru! Keep on playin' that boojie - woojie music.